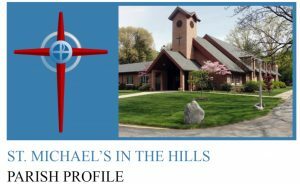 Common Grounds adult seminar is a vital part of Christian Education at St. Michael’s in the Hills. Each Sunday, after the 9:45 worship service, all adults are invited to the Fellowship Hall for presentations of spiritual, cultural and social topics. Presenters are often congregation members, spotlighting the wealth of talent and experience in our parish. Church organizations and committees are welcome to use Common Grounds as a forum for increasing awareness for special needs and projects. We look forward to annual presentations from youth group summer experiences, reports from vestry, craft-making experiences for our FOCUS Christmas party and Christmas storytelling by congregation members. Talks normally start around 11:00 AM and last approximately 45 minutes including time for questions and answers. Join us at 8:00 or 9:45 am in joyous celebration at worship. Due to the route of the Glass City Marathon, our Sunday worship service will take place at 5 pm and will be Evening Prayer!